Want to know which part of your site or blog will bring you more profit? Add AdSense inside posts and then check out the famous Google AdSense heat map. Recent studies, however, showed that placing AdSense after the first paragraph of a site or blog is one of the best AdSense placement. Unfortunately, the default Blogger platform offered by Google doesn't allow placement of ad after the first paragraph. But because it has become one of the most profitable areas, plenty of webmasters have tried to take advantage of the best AdSense placement. How can you enjoy the same level of profit? 1. Log into your Blogger account, select your blog and click "Template" on the left side. Open the Template editor using the "Edit HTML" button. Note: You will find multiple occurrences of <data:post.body/> but you need to stop at the second one, or if you don't see any changes, test the last one. - To insert the ad after the second paragraph, change "0" from the line in red with "2". - If you want to put AdSense just below the heading h2 or heading h3 of a post, replace br from &quot;br&quot; with h2 or h3. 6. Click "Save template" to save the changes and you're done. With this trick, you can insert AdSense after the first paragraph automatically in Blogger with ease. Now it's your turn to decide which format works best on your site. What better ads on below title or inside post? but what if we also want to add some ads after title????? It works only for adsense publishers, how it work for other publishers. Please guide. Ohh! I really want this so now we place anywhere in blogger middle, below title,after paragraph also. Thanks very much for sharing such useful information like these. Dear Admin I have been learning from your posts for the last few months. Dear, I just insert adsense widget to show ads. I do not create ad unit code to parse but your this post works only for those who create ad unit code (i think). 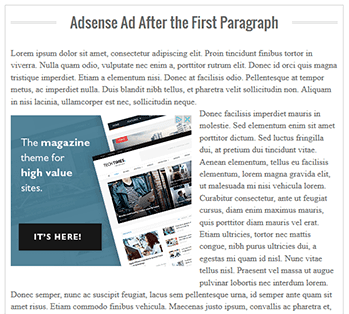 How may I insert adsense in my paragraphs with only adsense widget not the ad unit code? Great, Worked on my blog. Thanks for sharing.